Started in 2013, MAN CHOIR is open to all men. 'Open to all men' means no auditions, no tests, nothing like that - just turn up and start enjoying yourself. You don't to be able to read music, because everything is 'taught by ear'. That means that I sing small parts, you (and those around you) listen, and then sing it back - and that's how you learn. You'd be amazed what brilliant, interesting songs with 3, 4 or more harmony parts you can learn that way! You don't even need any singing experience. 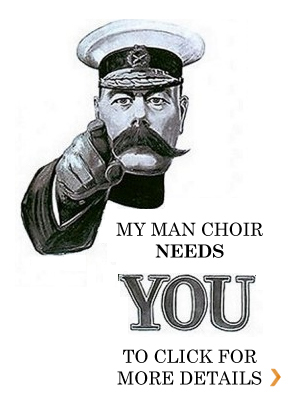 Indeed, one of the main reasons MAN CHOIR exists is to give all blokes an opportunity to enjoy singing great songs with a fine band of man. (Note: fine band of men subject to availability). I do - I'm Philip Read, a professional singer, experienced singing workshop and community choir leader. Where, when and how much is it? Terribly sorry. Why don't you just email me, or give me a call? I'd love to hear from you. My details are all over here.